In the past I found Plaxo very useful. It started life as a contact manager where you stored the contact details for business and personal use. It’s unique selling point was that your contacts could update there own details once for all Plaxo users, so to update your list you just need to click a button to accept the changes. This was fairly useful, and it became more so and more of my contacts started using it. It took me a while to trust the site, as it does with all sites that hold personal data, but I do trust it as much as I do any other online service. It also had the advantage of syncing contacts and calenders between Outlook, GMail and many other online services. While friends were using many services to sync there contacts and calenders I was using just Plaxo with one plugin. I did start to write a blog post about how great this was, but like so many I never got round to finishing it. Sorry. Then at some point Plaxo realised that they had the backbone of a Social Network, and created “Plaxo Pulse” that brings all your content in to the Plaxo interface. In some ways this is nice, and optional, but not something that was useful to me or the Plaxo user base at the time. Sadly with next to no notice the syncing with Outlook has been made a premium service, so will need playing for. There is nothing for nothing and the site does need to make money to continue, so I will not complain about this, but I have decided to move away from Plaxo as it is no longer of use to me. I have decided to use the contact management in GMail for now that can be synced to Outlook using a free app. I will continue to use Plaxo to sync with other “backup” online services (Yahoo and Live mail for example) for the moment as there is no reason to stop. I will let Pulse continue consolidate the rest of my feeds for the same reason, and one friend prefers to consume it that way. Sadly though I do feel that today is the day I regrettably stopped using Plaxo. As some of you may know I have been carrying a yellow plastic duck with me recently and taking pictures of it. At first this might seem the actions of a mad man, but I can explain. In 2008 I attended BathCamp, a BarCamp unconference in Bath. There was a bath at BathCamp that contained ice, cans of beer, and lots and lots of plastic ducks. At then end of the event we were given the ducks and asked to take pictures of them in cool places. There is a competition, but I don’t know if there is a prize, or if it is still happening. Now to 2009. As you may know I like to take the odd picture with a digital camera and many friends who are in to photography. I was persuaded to give Project 365 a go. This is when you take a picture every day and upload it to the Internet. As I often had the duck with me just in case of a cool photo opportunity I decided it would be fun to do an additional Project 365 for the duck. I called this Duck 365. Now with that almost making sense I should perhaps stop explaining, but I will instead continue. When you upload a Project 365 photo you tend to write a bit of text about the shot. With the duck photos I decided to do the write-up from the duck’s perspective, and inadvertently gave the duck a personality. 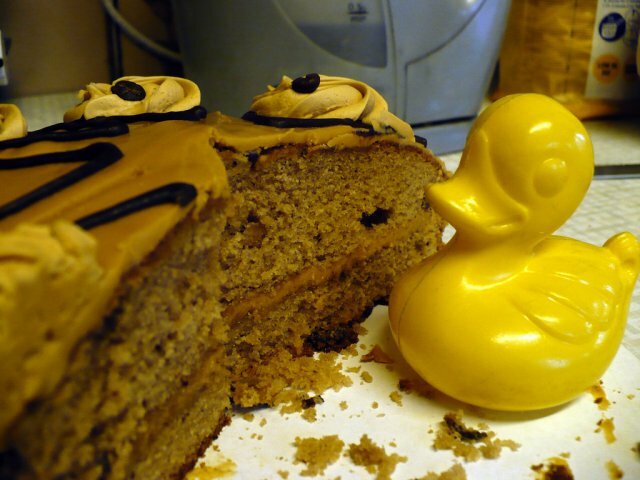 The duck has slowly been gathering a back story. He just kind of came in to existence so sees what is happening but does not understand it all. In many ways he has the brain of an adult with the understanding of a toddler. He is aware that he is a plastic/rubber duck, but he also thinks he is a real duck, and at times a human. He is also rather cantankerous at times and blames me for most things that do not go the way he expects. Originally I was pointing out that the duck did not really exist, but people seemed to get rather upset by this, so I will go along with him being real for now. People now call him Mr Duck, bring there ducks to meet him, and even given him his own conference badges. 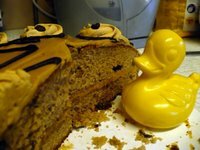 You can follow Mr Duck on his page here, through his flickr set, on his Facebook page, or his Twitter stream. Quite a few people seems to do so and I hope it is because of the humour I try an inject. Last week we all turned up at the Guardian offices for Music Hack Day not quite knowing what to expect but prepared for most eventualities. I still did not know what to hack together and no one I knew had any real ideas yet. There was not really an opportunity to find anyone else to do something with so I decided to do something with my old WaveFinder DAB radio, possibly doing something with RadioDNS and linking it to some of the sponsoring online services. Unforchantly a couple of hours later I still could not get the hardware working on my laptop so decided to play with the Arduino and make some kind of music machine as a learning exercise. After a lot of fiddling, scavenging, stripping wires, battling with wifi, messing around with hardware, lots of chatting, a late night visit to Avenue Q, some Geocaching, three hours sleep, and drinking lost of tea the percussion machine was born. Come 2pm on Sunday, we gathered to see what people had come up with. Now, some of the presentations were a little – how can I put this – impenetrable for a non-techie like me. Others, however, seemed happy to admit they’d spent the night messing around on a project for no other benefit than their (and our) own amusement (step forward the Percussion Machine, a hardware hack using an Arduino microcontroller that involved turning some empty beer bottles into a drumkit). Music Hack Day : What to do? This weekend is Music Hack Day in London, an overnight hacking event help in the Guardian offices, London. If you are wanting to take part I believe there are still places remaining. I must confess that I am not really feeling the event yet, probably because of the lack of communication and no real online buzz, but hopefully I will spring in to gear when I am surrounded by fellow coders and geeks. What I do not have at the moment is any idea of what to develop. Do you have any ideas or have you gut a team that would benefit from my skills? If so please let me know. Remember it needs to have a music element to the idea and use an API from one of the sponsors. Ps. If you are an organiser then I have been trying to get in contact. (please please can you get in touch).